I have no idea why, or for what purpose, but this is the idea I'm floating. Luxu and Young Eraqus sound alike, obviously, but also looking back on that YMX/Eraqus conversation with this in mind paints them in a new light. It was pretty obvious from the start that YMX is claiming that Eraqus is pretending not to know about the lost masters and the Keyblade War. It was never quite clear why YMX is so sure, but more importantly, why Eraqus would lie about it. But the more I watched these with this Luxu thought in mind, I think it points to YMX knowing that Eraqus has some connection to the war itself. Take a look at the E3 2014 conversation again. There is so much emphasis placed on that last line -- "But you knew that... didn't you?". And what purpose is that line except to throw suspicion onto Eraqus? 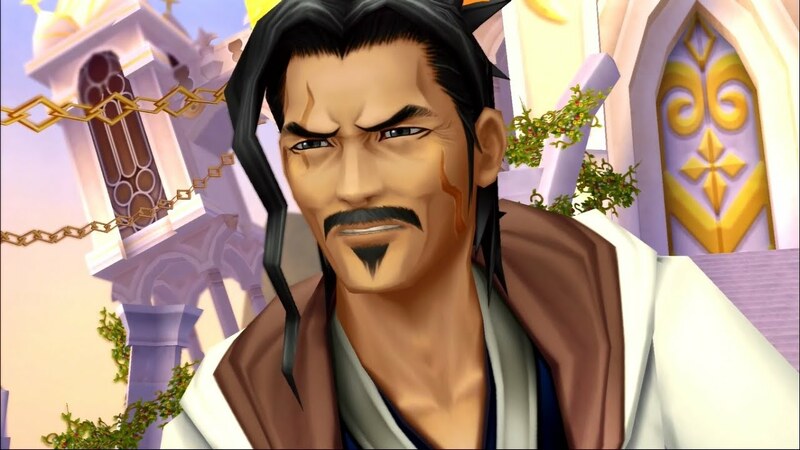 I think a lot of us didn't read into it too much because, you know, Xehanort is the obviously evil one, and at this point Eraqus' character is only slightly fleshed out in BBS. Of course the conversation shows up again in the 2015 trailer, now as a proper cutscene. This clip loses the ending of the 2014 trailer, but it still manages to paint Eraqus in a suspicious light (tho it's masked by also painting Xehanort with a sinister light which is why I don't think most people picked up on it at first). 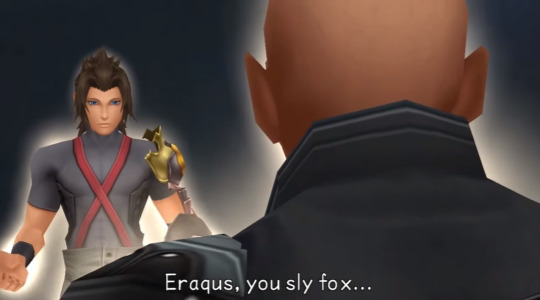 Xehanort tells Eraqus to "drop the facade" and at the end when Eraqus tells Xehanort that there is "more to light than meets the eye", Xehanort's responding "Oh, I hope so", in this context, now seems less like something nearly mustache-twirling evil (or sexually tension-y dependin on who u be) and now sounds more like... knowing teasing all most. Like he knows there is more to Eraqus than meets the eye. It's also interesting that KH3 trailers in general seeming to be building up Eraqus more and his importance. As pointed out by Tinny, Eraqus features in some form in every major trailer, even starting with the announcement trailer where Sora picks up the Master Keeper. Eraqus is clearly being built up to be something bigger than he original was, the question is just to what end, and for what purpose? That, I have no earthly clue on. On its face it seems completely random, and I'll definitely admit the evidence is circumstantial (after all, Luxu only has one line of spoken dialogue so far, it might just be imaginary that they sound like the same actor). But with Luxu and Eraqus sounding so alike so far, and the new look at what we've already been shown about KH3... Idk. I think there might be something there worth thinking about and discussing. Something about Luxu though doesn't strike me as "evil" like one might originally believe. Perhaps he is meant to be an analogue to Xehanort -- two people who once held the same blade, but ended up on different sides. Eraqus' insistence that darkness won't prevail anymore might be a sign that Luxu (as Eraqus) seeks to prevent this future war from happening in a way he couldn't before, since his mission was only to watch. It would also add some depth to Eraqus' actions in BBS and why he tried so hard to prevent Xehanort from starting the war again (enough to kill his own pupil). We also have to keep in mind that Luxu's mission is to move on to the world after the Keyblade War. It's explicit that his goal is to survive it and live on in New World. Perhaps this is where he ends up? I have no clue how, though, lol. Or how it fits together, really. Or really why this development would happen. But so far it seems to be the only connection to Luxu's identity that I can see right now. And, of course, we also know that Eraqus himself is still possibly in play in some way -- his heart is with Terra right now, but that does leave the chance of a revival open. XEHANORT: On that land shall darkness prevail and light expire. The future, it's already been written. ERAQUS: Who's to say I can't change it? I'm sure I'm not the first person to bring this up, but I couldn't see any thread about it so I thought I'd make one. What does everyone think? It never occurred to me that Luxu might not be the obvious pick: Xehanort. And personally, many of us have scratched Eraqus aside because, since he died, he'll stay dead and have little to no participation in the final clash between the Guardians and the Seekers. But your suggestion, albeit not very solid, brings a new light (pun intended, heehee). And it wouldn't be farfetched to think that Luxu/Eraqus renounced to the Goatblade and decided to use another Keyblade. The Master's Keeper could be from his new Master, but this is assuming the Goatblade was MoM's Keyblade that he passed on to Luxu. Maybe this is why Eraqus is so "light as absolute" in BBS. He's seen personally what happens when darkness grows within the heart, and after the war became convinced the only way to prevent it from happening again was championing light at all costs, to the exclusion of the dark? Hmm... Right. And assuming that Luxu manages to pass onto the New World, then Xehanort isn't the candidate because Xehanort's speaking suggests he found out about the KHx era instead of knowing of it, while Eraqus seems to know and is pretending he doesnt'. This is a very interesting observation. Plus, it's a good way to connect 0.2 and X Back Cover with characters. It could even provide a deeper understand as to why the Master of Masters wanted to travel alone. To understand the threat of the future and have someone prevent that from occurring. While I agree Eraqus has some secrets an a role to play, I don't think it necessarily converges to him being Luxu. I think we're all aware of the time barrier between Chi and BbS and its implications so I won't waste anyone's time with that, we'll see. It's still there, obviously. That being said, this is a theory that made most sense the more I kept thinking about it. I guess we can see Luxu/Eraqus using that Keyblade under MoM's orders and casting it away after seeing... something, the same thing which made him develop his Darkness and X-Blade phobia. A few things like Eraqus' behaviour in BbS and some of Xehanort's line still make me think their Master is more involved in Chi than Eraqus himself, but nothing about this theory seems horribly wrong. One last thing, seen how this thread went on describing Eraqus as the "good" one: Xehanort is not really "evil", just ruthless curious. True, he won't stop at nothing in order to obtain his goals, but he's been seen showing unexpected care, such as when he writes that he found the idea of Ventus finding peace of mind at the Islands comforting. I think he avoids conflict when he can. And... nothing, this was just a side note. Would be an interesting plot-twist if both Xehanort and Eraqus ended up coming both from the KHx era. Maybe Eraqus retained knowledge, while Xehanort went amnesiac. Something along the lines of Sephiroth going mad after discovering his past. this may shock u but someone willing to commit mass genocide for "curiosity" is actually evil. he's been seen showing unexpected care, such as when he writes that he found the idea of Ventus finding peace of mind at the Islands comforting. yes, how nice of him to put to rest the body of the ten-year old he murdered. clearly misunderstood good guy. I think he avoids conflict when he can. he's literally instigating a war. Would, at least for now, explain a lot of things, like Young Xehanort immediately accepting Ansem's truth. This is kind of stepping into semantics, but... no. One who commits mass genocide for pleasure is definitely evil. First, Xehanort's main goal isn't mass genocide. He isn't curious about the mass genocide. Second, he's curious about "neutral" objectives, such as knowledge and be worthy of the Light. Because I obviously said that. Also, I understand it's purposedly exaggerated, but he didn't murder anyone. You're making it sound like he purposedly wanted Ventus in that condition, while he clearly wanted him to be in shape and conscious. For this and the previous point: that doesn't make him good, as I never stated that. But BbS clearly show you that Xehanort doesn't find pleasure in hurting other, while he also doesn't find guilt in it: they're just instruments. He also doesn't pursue evil goals, only the means are evil. Definitely on the bad side, selfish and inexcusable: but just labelling him as "evil" seems like judging him by the cover. Don't take parts out of context: I claimed at the beginning that he's a ruthless person who does whatever he pleases. Again, he's not a saint. Right, but like, using evil makes you evil. There are no semantics here, he wants everything to be destroyed so he can create something to his own liking. Like, yeah he wanted Ven in shape...so that he could use him to create a weapon of mass destruction. Like, there's hopefully more to Xehanort than his objective of a second keyblade war, but there's no sugar-coating the evilness of it. Contemplate how Master Xehanort looks down on TAV when he's about to make a dark bomb explode and separate them. His eyes focuses on them as he smiles. He doesn't care what happens to them. His expression is all like: "Oh, look. Some pawn in front of me, the King chess piece. Here, have a bomb and GTFO." I know this doesn't count at all, but I highly doubt people irl would look at MX and say "what a nice gramps". He is evil. There is literally no denying that. Look at what he did to TAV. One who commits mass genocide for any reason is evil, regardless of whether or not someone takes "pleasure" in it. Yes, he absolutely is? He wants to start another universe-destroying Keyblade War because he's curious if humanity will be deemed worthy of survival again. forged, and with it, the door to the Keyblade War unlocked! Eraqus: Fool... You would risk an apocalypse out of sheer curiosity? You're making it sound like he purposedly wanted Ventus in that condition, while he clearly wanted him to be in shape and conscious. He summons Neoshadows to put Ventus in a life or death situation and while Ventus pleads that he is not ready for this and can't do it, Xehanort watches as they kill him. That's murder. And the flipside of this, is if it hadn't killed Ventus and succeeded in his other plan, then he would have been molding a ten year old boy to be his vessel so he could take control of him or turn him into a weapon of mass-destruction. Like??? Who cares if he finds pleasure in it or not? What matters are his actions. You can point to the fact that Xehanort has aggressively dehumanized literally everyone, but that's not a defense that he's not evil. It's more of an admission of it. but just labelling him as "evil" seems like judging him by the cover. yes, poor xehanort, being mislabled as evil for committing murder, body-snatching, human experiments, the destruction of hundreds of worlds, conspiring to bring about the apocalypse, and so on. But Luxu wields Xehanort's keyblade, doesn't he? (or is it the other way around?) Can't really see Eraqus wielding that blade to be honest, neither does Luxu's behaviour match Eraqus' (from what we've seen). Xehanort is most definitely evil. He's the definition of a mad man that took a wrong turn at some point in his life in regard to ethics. He became so utterly curious that suddenly morals didn't matter anymore and he knows what he's doing. To disregard the well-being of others for the sake of fulfilling your curiosity is evil. He does not care who he hurts and clearly likes watches people fumble trying to stop him. He's the smuggest grandpa you'll ever meet. While I do want to know how Xehanort got to this point and what exactly made him so curious and what his vision is, that's no excuse for the pain he's caused everyone. While I think he's partially correct that balance is a must and that there can be a tyranny of light, his method of addressing it much worse than anything Eraqus would have done. I think it's less he enjoys it and more he knows/has been lead to believe that literally everything in this world exists for him. That he was pre ordained to be the villain and so he has every right to use and abuse people because well that is his role in life. Just like he believes nothing he did to TAV was his fault "they were always meant for those fates I was merely the guide selected to lead them to it". To put it another way Xehanort is a litteral self insert of an immature child. Here are all these stories that had ways they were meant to go but Xehanort had to stick his nose in them. He forcibly messed up and made himself a part of tales and lives that he was never meant to screw with. Of course he is a litteral embodiment of a bad insert, he made himself to be this all powerful all knowing edgy villain who is both a wielder, a master, a controller of the untamable darkness, and knower of many ancient secrets. Of course simply turning the entire universe into his own fanfic wasn't enough, he wasn't satisfied with that role. No he had to steal the lives and roles of others. Just like a child "I want to be incredibly gifted handsome silver haired youth who can also wield darkness and the keyblade" "I wanna be the cryptic and mysterious wild card sharpshooter" "I want to be the incredibly ripped young man overflowing with power". And then whenever Sora came around and ruined his little fanfic he kept changing the rules. "Oh you never beat me just my heartless which is still alive forever as a part of Riku while my Nobody is still around." "Oh you destroyed all my halves and ruined all my plans but see this just means I can come back and in reality this was what I wanted so now I have an unbeatable plan...oh and I can time travel now so all my defeated selves are still here". Then we get into time travel which is him literally turning the world into a fanfic about his rise to power. And you know I believe this is absolutely intentional on how it's to be read because even Axel mentions it "you had this whole perfect script written out but you forgot to write the sequel lets see what happens now". And of course while true there is Xehanort again "oh I didn't need to write a sequel see my actions will influence a guy in the past to gaze into the future and write the sequel for me and guess what it says I get my fight so haha". So not evil so much so he is a kid at heart like Sora, but a spoiled bratty twisted one that wasn't disciplined well and grew up to be the same bratty spoiled kid but overwhelmingly powerful and now able to live out a twisted fan fiction that only a "oooh super edgy" kid would actually want. ...I see we have quite a lot of Eraquses here. - "Doing evil makes you evil": wow, that's... overly simplistic. So, doing good makes you good? 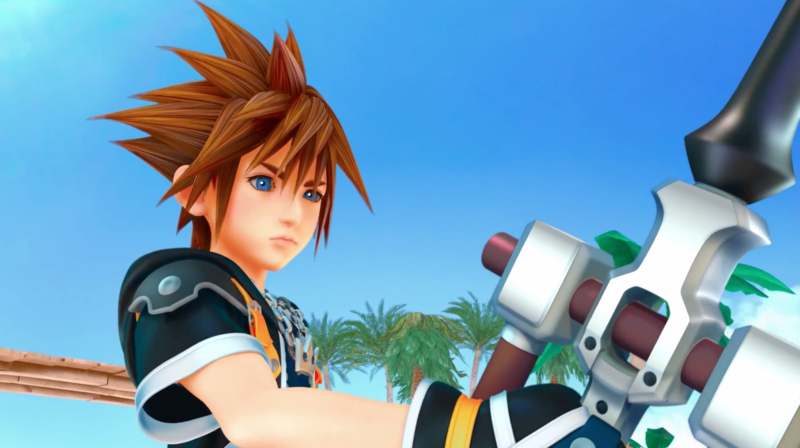 Sora completed the final Keyhole and the Door to Darkness, what makes him? - "Look at what he did to x": same as before, and again: he did some good things too. Not the most generous things in the universe, but things he could've not done at all. And I'm using your "what you do define what you are" logic here. Xehanort did bad things and he did kind things. Obviously both you and me are going with the majority: he did mostly bad things, he's clearly more bad. But can you see how flawed the reasoning in itself is? - "*sarcastic comment about him not being good*"
I never said that. It's not always black and white, that's like Kingdom Hearts first rule. People. Don't just look at one's action, try to understand him. I mean, think what you want of a fictional videogame character, but in general. he did some good things too. Aside from laying to rest the body of the child he killed, what are the "good" things he did? Didn't Nomura say that Xehanort is the opposite of Sora? If so, doesn't that automatically and logically render it as the antagonist? Other than that: he's the leader of the evil faction. Master Xehanort has proven it countless times that he is evil. He orchestrated a whole series of events for his own gain that cost people their lives, their hearts, that nearly plunged the whole universe into darkness. At this point his curiosity... his obsession caused him to do things which only evil people do. Yes you are right the things are not always black and white, but honestly Xehanort doesn't have any redeeming features. He never did any kind things which didn't serve him in the long run. Every action Xehanort has taken during the games from BBS to the end of DDD served his purpose at one point. And I do understand that he has a bad case of obsession, but that really isn't going to make his crimes any lesser.